Umagico is 1 of the 5 communities which collectively form the Northern Peninsula Area, also known as the NPA. The landmass of the NPA consists of 1,030km2 in the northern most region of Cape York. Injinoo, New Mapoon, Seisia and Bamaga communities make up the remainder of the NPA. Umagico, originally and still locally known as Alau, was one of several traditional Aboriginal camping sites on the western beaches of Northern Cape York Peninsula. The Gumakudin people are thought to have traditionally occupied Alau prior to first contact. In 1897, Archibald Meston submitted a report on the Aborigines of Queensland in which he suggested the population between Newcastle Bay and Cape York had decreased from 3,000 to less than 300 people. By 1900, Aboriginal populations in the Cape York Peninsula area had been decimated as a result of introduced disease, exclusions from traditional hunting grounds, and by the brutality of the Native Police and Somerset’s Police Magistrates, most notoriously Frank Jardine. By 1915, remnants of the Aboriginal population had autonomously regrouped at Red Island Point (later known as Seisia) and Cowal Creek (known then as Small River and later as Injinoo). Both communities approached the government for land to establish gardens, leading to the creation of an Aboriginal reserve at Cowal Creek in 1915. By 1918, the Cowal Creek community was functioning as a self-sufficient community, managed by a self-elected council. The community grew during the 1920s and 1930s with the inclusion of Aboriginal groups who moved from the McDonnell Ranges, Red Island Point and Seven Rivers. In 1923, Anglican missionaries and school teachers arrived at Cowal Creek and increasingly took on administrative functions in the community. After World War Two, populations in Northern Cape York Peninsula were again transformed, as Torres Strait Islanders began resettling in the area. The government began developing the area to accommodate this settlement and encouraged other Islanders to come. Saibai Islanders affected by a storm surge that inundated their island in 1948, had also established communities at Red Island Point at Muttee Heads. To accommodate the Saibai Islanders and other Torres Strait Islander people who had decided to move to the NPA, the government created a reserve at Red Island Point in 1948. This reserve was amalgamated with the adjoining Cowal Creek Reserve. After the amalgamation, the reserve consisted of 97,620 acres populated by around 350 people. During the 1950s, many of the Saibai Islanders who established themselves at Muttee Heads and Red Island Point moved to Bamaga as the government developed the township, erected accommodation and developed agricultural and sawmilling industries. Bamaga was established as the administrative centre for the NPA. Umagico was established in 1963 when the government relocated 64 Aboriginal people from Lockhart River Mission to the area. After the Anglican Church relinquished responsibility for the Lockhart River Mission in 1960, the government proposed closing down the mission and resettling residents at Bamaga. The majority of residents rejected this proposal and remained at the old mission site. Those resettled at Umagico accepted the site as an alternative. After the Lockhart River community was re-established at the current site by the government in 1970, some of the people who had been relocated to the Umagico area in the 1960s returned to live at Lockhart. At this time, people from Moa Island in the western Torres Strait were also resettled at Umagico. On 30 March 1985, the Umagico community elected 5 councillors to constitute the Umagico Aboriginal Council established under the Community Services (Aborigines) Act 1984. The Act conferred local government type powers and responsibilities upon Aboriginal councils for the first time. Seisia, New Mapoon, Cowal Creek and Bamaga also elected council representatives at this time. On 27 October 1986 the Umagico council area, previously an Aboriginal reserve held by the Queensland government, was transferred to the trusteeship of the Umagico Shire Council under a Deed of Grant in Trust (DOGIT) lease. On 1 January 2005, the Umagico Aboriginal Council became the Umagico Aboriginal Shire Council. In 2007, the Local Government Reform Commission recommended that the 3 NPA Aboriginal councils and the 2 NPA Torres Strait Islander councils be abolished and a Northern Peninsula Area Regional Council be established in their place. The first Northern Peninsula Area Regional Council (NPARC) was elected on 15 March 2008 in elections conducted under the Local Government Act 1993. N Sharp, Footprints Along the Cape York Sand Beaches (Aboriginal Studies Press, Canberra; 1992) 3, 85. Archibald Meston’s Report on the Aboriginals of Queensland to the Home Secretary, QLA, V&P (1896) vol.4, 1, 724; Queensland State Archives, Home Secretary’s Office, Series SRS 5263/1, General Correspondance, Item HOM/J717, 1929/3999, memo re Aboriginal Reservations. Sharp, above n 1, 55-58; J Richards, The Secret War: a True History of Queensland’s Native Police (Queensland University Press, St Lucia; 2008) 42. By 1911, Yadhaigana, Wuthathi, Unduyamo and Gudang people from the north and the east, had established themselves as a single group at Red Island Point. Other Yadhaigana people and Wuthathi had formed a group at Injinoo. Sharp, above n 1, 85-87. Queensland State Archives, Home Secretary’s Office, Series SRS 5263/1, General Correspondance, Item HOM/J129 1914/9001 Chief Protector of Aboriginals: Report of Chief Protector of Aboriginals on Annual Inspection of Northern Institutions, 195; Queensland, Queensland Government Gazette, 23 October 1915, 1374. Sharp, above n 1, 94-95. Queensland, Report on the Operations of Certain Sub-Departments of the Home Secretary’s Department - Aboriginals Department - Information Contained in Report for the Year ended 31 December, 1920 (1921) 9; Sharp, above n 1, 85-87. An alternative source is the PhD thesis by Dr Susan McIntyre-Tamwoy, which suggests that the move of people to join the Cowal Creek community was not voluntary. Dr McIntyre-Tamwoy describes an account told by McDonnell River people that Alick Whitesand, a Wuthathi man, accompanied by police, forced people to move to Cowal Creek. See: S McIntyre-Tamwoy, Red Devils and White Men (PhD thesis, James Cook University, Townsville; 2000). Canon John Done, Supervisor of the Anglican mission for the Diocese of Carpentaria, began visiting the community after World War One. See J J Done, Wings Across the Sea (Booralong Publications, Brisbane; 1987). The mission was initially financed by voluntary contributions from churches in the Torres Strait. A teacher named Satraika from Mabuiag was appointed to the school. Later, Islander teachers from Badu named Rev. Francis Bowie and Jomen Tamwoy came to the community. See Sharp, above n 1, 90, 95. Queensland, Native Affairs – Information contained in Report of Director of Native Affairs for the Twelve Months ended 30 June 1948 (1948) 2. Queensland, Native Affairs – Information contained in Report of Director of Native Affairs for the Twelve Months ended 30 June 1948 (1948) 2, 22; D Ober, J Sproats and R Mitchell, Saibai to Bamaga, The Migration from Saibai to Bamaga on the Cape York Peninsula (Bamaga Island Council and Joe Sproats and Associates, Townsville; 2000). Queensland, Native Affairs – Information contained in Report of Director of Native Affairs for the Twelve Months ended 30 June 1952 (1952) 26; Queensland, Queensland Government Gazette, 24 July 1948, 675. Queensland, Native Affairs – Information contained in Report of Director of Native Affairs for the Twelve Months ended 30 June 1952 (1952) 26; Queensland, Native Affairs – Information contained in Report of Director of Native Affairs for the Twelve Months ended 30 June 1953 (1953) 30; Queensland, Native Affairs – Information contained in Report of Director of Native Affairs for the Twelve Months ended 30 June 1954 (1954) 29-30. Queensland, Native Affairs – Information contained in Report of Director of Native Affairs for the Twelve Months ended 30 June 1964 (1964) 16. A. Chase, Which Way now? Tradition, continuity and change in a North Queensland Aboriginal Community (Unpublished PhD thesis, University of Queensland, 1980) 124-127; D. Thompson, Struggling for Relevance in Lockhart River, Lecture in Northern Queensland History (1996), 5(142-168). Students of Bamaga High School, North of the Jardine: a look at the five communities of the N.P.A. (Bamaga State High School, Bamaga; 1987); Chase, above n 14, 124-127; Thompson, above n 14, 142 -168. Umagico DOGIT is defined in the Northern Peninsula Area Infrastructure ILUA as comprising: Lot 58 on Crown Plan S055, County of Somerset, Parish of Cowal, Title Reference 21328058. For information on the election of Community Councils, see Queensland, Annual Report of Department of Community Services for 1986 (1987) 3. For information regarding the granting of DOGIT lease dates for each community in trust area, see Queensland, Annual Report of Department of Community Services for 1987 (1988) 29. 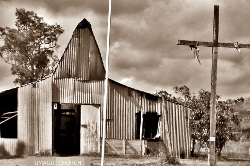 Photo of the old tin church at Umagico.